Wish you could watch YouTube videos on your Apple TV? 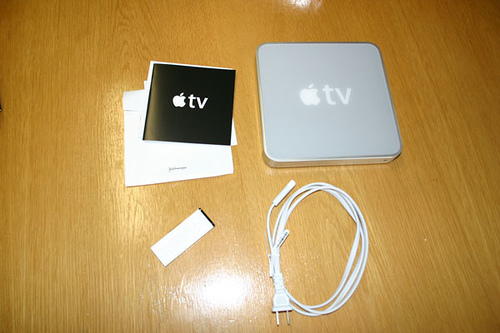 Sometime in June, all Internet connected Apple TV boxes will accept a free software patch that will enable wireless streaming of YouTube videos. YouTube is making thousands of clips available each week until thier full catalog is accessible later this fall. You’ll be able browse the YouTube content on your Apple TV in a variety of ways including: featured, top viewed, recently viewed, history, and even by search. I’m dreading the search option. If you haven’t used the Apple TV yet, there’s a USB port in the back of the device, but you currently can’t use a keyboard for some reason. Entering text on the Apple TV is the equivalent of typing in your initials for the high score screen in an arcade game. Very painful without a keyboard. So how chewy will these compressed YouTube videos look on your HD TV? I’ve already ripped a bunch of music videos off YouTube, converted them to MPEG-4 videos and saved them in iTunes. Honestly, the Flash encoded YouTube videos look like crap on a HD TV. YouTube doesn’t even look good when stretched out to its default 480 x 360, let alone 640 x 480 or HD. But YouTube does have thousands of clips and can provide endless hours of entertainment. Fuzzy, but fun. Apple also announced a new Apple TV model with a 160 GB hard drive for $400. You’ll still be able to buy the old 40 GB version for $300, but personally, I think $100 for 4x the storage is a great deal.